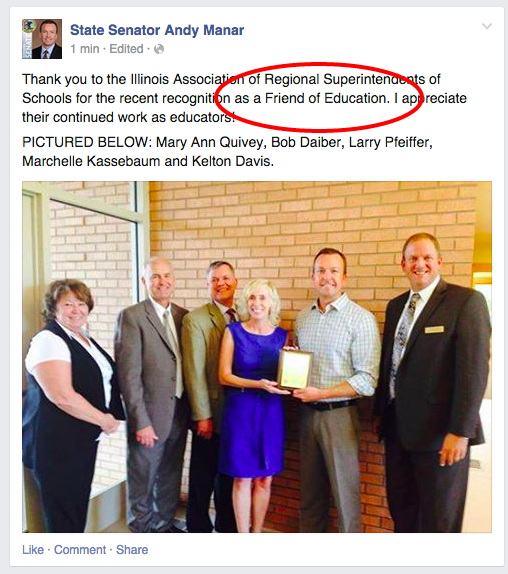 That's a *VERY* Unusual Use Of The Word "Friend"
We saw this post over on State Senator Andy Manar's Facebook Wall. You might remember Senator Andy Manar from such terrible pieces of legislation as SB16 which would gut school funding in the suburbs. And...we had to break out the paper towels and screen our laptop screen. Go over here to learn more about how you can join your fellow taxpayers in Illinois and sign a petition to help stop SB16.